•1st Seminar: Dan Healey (University of Reading ), “Disabled Prisoners in the Stalin-era Gulag (1930-1953).” 5 February 2013. 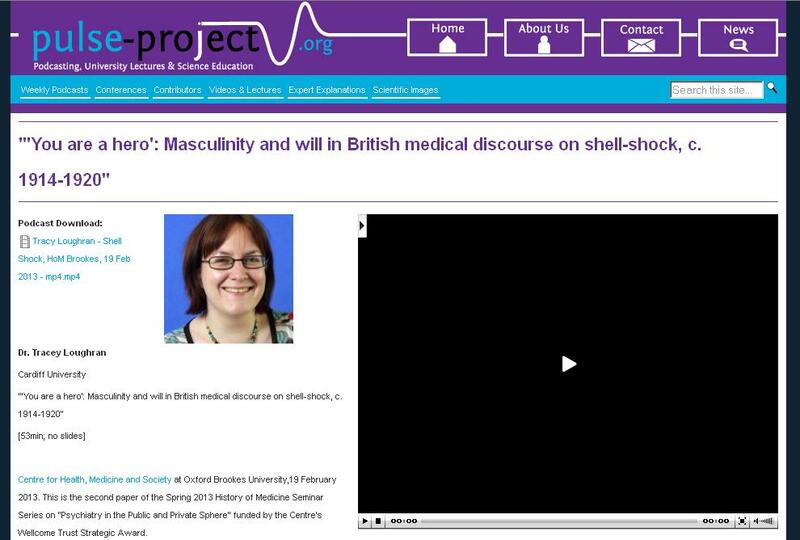 •2nd Seminar: Tracey Loughran (Cardiff University), “‘You are a hero’: Masculinity and will in British medical discourse on shell-shock, c. 1914-1920.” 19 February 2013. •3rd Seminar: Thomas Müller (University of Ulm at Ravensburg), “Medical History, the Historian’s Reality and the Public: The Example of National Socialist Psychiatry.” 5 March 2013. •4th Seminar: Louise Hide (Birkbeck, University of London), “Rats Biting, Worms Crawling, Devils at Work: Can recorded delusions provide historians with insight into the subjective experiences of asylum patients?” 19 March 2013. •5th Seminar: Linda Reeder (University of Missouri), “The Means to An End: Psychiatry and the Significance of Marriage in Liberal Italy.” 16 April 2013. •6th Seminar: Waltraud Ernst (Oxford Brookes University), “Colonialism and Transnational Psychiatry: The Case of the Ranchi Indian Mental Hospital, c. 1925-1940.” 30 April 2013. Birkbeck Pain Project’s podcasts on “Pain and its meanings” (7-8 December 2012) and a number of other podcasts from earlier events organised by the project. Sick City Talks [on London] which form part of a Wellcome Trust funded project on the history, literature, art and science of medicine in London. The Northern Centre for the History of Medicine, Newcastle University has a Pybus Podcast Collection of recording from the Pybus Seminar Series. This entry was posted in Electronic resources, News, Talks & events and tagged podcasts on 7 May 2013 by .